There’s a new dessert pie in town—and it boasts of a classic Pinoy dessert favorite at its core. Thanks to its vivid purple hue and irresistible combination of sweetness, good mouthfeel and texture that simply melts in the mouth, ube has taken the culinary world by storm over the last couple of years. Chefs and taste-makers across the globe cannot get enough of ube, as seen in glowing features in publications like GQ and HuffPost. “Ube fanatics will be happy to know that there’s a new ube treat for them when craving strikes. Just drop by the nearest Jollibee for an authentic, delightful Ube Pie!” added Segismundo. Indulge in your ube cravings with the new Ube Pie, available in all Jollibee stores nationwide for dine-in, take-out, drive-thru, and delivery starting May 21, 2018. 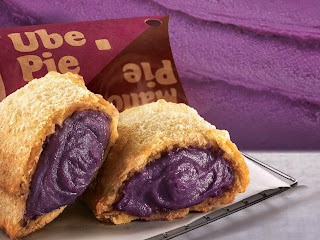 The Ube Pie will retail for P29.00* for solo and P82.00* for the Trio Pack.